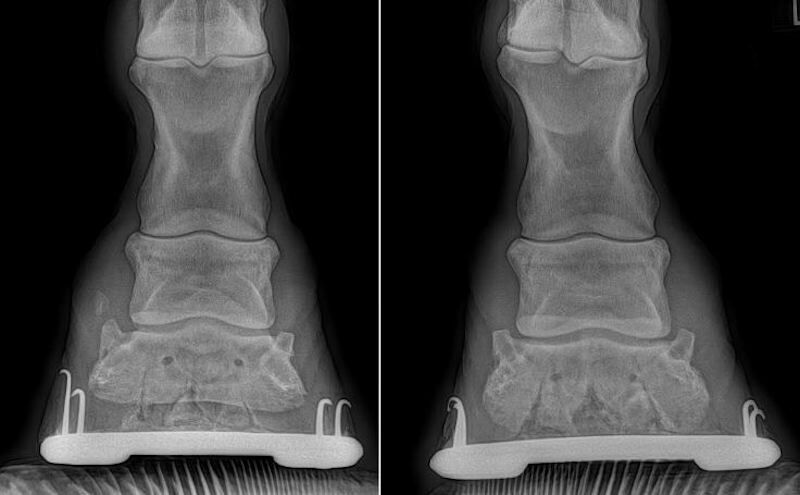 gtag('config', 'UA-119146981-1'); What do X-Rays of laminitis look like? I decided to share Aspota’s X-Rays with all of you because they offer a perfect portrayal of what laminitis in horses looks like. You can see that his right foot (pictured on the left) looks fairly normal and healthy for a 27-year-old horse. On the other hand, his left hoof (pictured on the right) has serious coffin bone rotation and very little sole left. Left foot verses right foot, you can see his left foot (pictured on the right) has serious coffin bone rotation from laminitis. Laminitis occurs when the supporting lamina in the hoof weakens, causing painful tearing of the structure responsible for supporting the pedal bone in the hoof. This can lead to sinking or rotation of the coffin bone. A number of things can cause the development of laminitis, and it can affect any type of horse at any age. There are treatments for laminitis, but laminitis treatments can be costly, time consuming and not always successful. Yet, if you talk to people who have brought horses back from laminitis, it is very much possible. Interestingly, my farrier told me a number of years ago that he could tell Aspota had laminitis in the past (before I got him, so before he was 10) by the bands visible on the exterior of his hoof. He said he could experience a laminitis outbreak again at any time in the future. Just as he predicted, Aspota’s laminitis started to return about a year ago. At first, he didn’t even seem lame but soon after the farrier alerted me to the problem, the lameness began. Since then, we have put him on a supplement rich in biotin and other fundamental nutrients (Remission by AniMed) and changed his diet so that it contains less sugars and starches. We also ran full panel blood work to make sure there weren’t any underlying issues such as Cushing’s Disease causing his laminitis. His blood work came back pretty darn close to perfect, especially considering he’s 27-years-old, nearly 28. The next step was to get X-Rays of his feet. We took pictures of both his left and right front hooves in order to get a good comparison. A head-on view of both his left and right hooves. Once again, you can clearly see sinking of his left coffin bone (pictured at right). How Much Do Horse X-Rays Cost? You might be wondering how much x-rays for horses cost. The price will vary based on where you live and the system your vet employee to get x-rays. Since the latest and greatest x-ray machine is over $100,000, most vets in San Diego rely on a secondary company to come out and take images. I paid $390 for a vet tech to come out and take images that I could see on the spot, including the fee for my vet to assess the pictures and fill me in. The process was quick and easy, but obviously not cheap. What X-Rays of Laminitis Show: Coffin Bone Rotation, Sole Depth, Etc. As my vet explained, Aspota hardly has any sole left before the coffin bone comes through the hoof. That’s scary, really scary. This is my baby we are talking about here. I’ve had him since we were both 10-years-old, he was my first horse and a horse I have promised to take care of until death do us part. There are two things giving me hope. One is that my vet seems somewhat hopeful that Aspota still has some good years left in him. Secondly, my vet shared a story about one of her other clients who had a horse whose coffin bone came out clear through the bottom of his hoof, they could literally see the bone protruding out. She recommended the client put the horse down, but the owner refused. The horse’s owner did a good job keeping up with cleanliness and preventing a bone infection, and the farrier did not touch the injured hoof in terms of trimming the sole for a number of months. The horse’s hoof has since grown out, re-covering the coffin bone and he’s doing well. Clearly, this story is a miracle but it still gave me hope. An experienced farrier will ask to see x-rays of laminitis before working on your horse’s hooves. This is helpful in numerous ways. First and foremost, they can’t actually see the rotation, hoof depth, and what’s truly going on without getting ‘inside’ the hoof wall. Seeing the amount of sole depth left helps prevent overtiming the hoof and putting your horse in more pain, and potentially even exposing the coffin bone (worst case scenario). Additionally, it guides your farrier in how to shape the hoof for utmost comfort and stability. 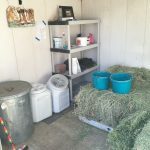 Treating Laminitis: What’s The Next Step After X-Rays? Thanks to the x-rays, my farrier can better shoe Aspota for comfort and long-term stability. My vet said we should not touch the bottom of his sole at all for the next few months. She said cutting away any of the little sole he has left could be detrimental. Over the next 4-6 months the hoof should naturally grow out and create a larger sole. My vet recommended (and my farrier agreed) I purchase a pair of special boots for him to wear that will increase his overall comfort and give him a little more padding. She mentioned two types, one of which is the Easyboot Cloud. Walking on these boots is supposed to be like walking on cushy clouds. She gave me some other options as well. I ended up going with the Cavallo Hoof Boots on Amazon because they are a decent price with good reviews. Aspota wears the boots on his front two feet for the majority of the day, but not all day, whenever he is going through a sore phase. Keep in mind, laminitis flair-ups and pain typically come and go. My vet warned me that some horses hardly tolerate hoof boots while other horses love them. I’d say Aspota is somewhere in the middle about them. 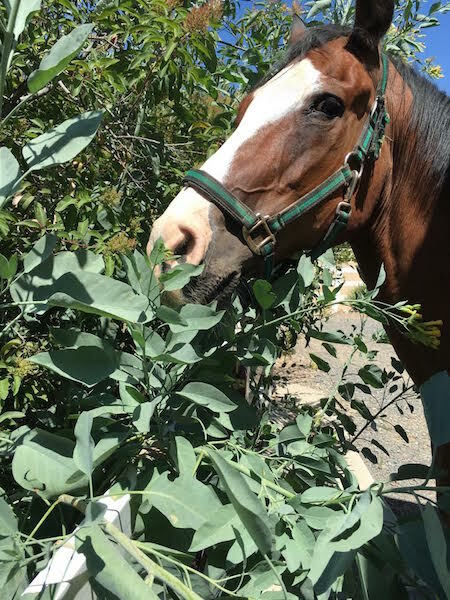 They especially help him walk over rocky or hard surfaces–hence why some people use them for trail rides even on healthy and sound horses. I also have him on Previcox, now Equinox, which is a long-term pain and anti-inflammatory pill. He gets one pill a day to help ease discomfort. The pill takes a couple days to start working but does a good job after that. When he’s off or going through an active and painful phase of laminitis, I switch him to bute because that seems to do the trick better. Aspota gets 1-2 scoops of Remission mixed in with his oats every day. My vet said the most important ingredient in this supplement is the biotin, which helps with healthy hoof growth. It promotes faster hoof growth, which is good in our case because we want his sole to grow out as fast as possible. 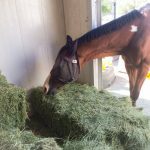 The ingredients in the supplement are great for all horses–I give it to my sound younger horse as well. I retired Aspota from carting me around on his back when he was around 26. In order to keep him moving he is regularly turned out in the arena and we go for long walks around 5 times a week. Blood flow is important for horses with laminitis and so standing in a stall for too long can cause a flair up. I am very diligent about getting him out as much as possible. Even when he’s limping a bit, my vet and farrier recommend I continue hand walking and trotting him as long as he doesn’t appear to be in too much pain.